Baby Lisa: Will Parents Allow Questioning of Sons? 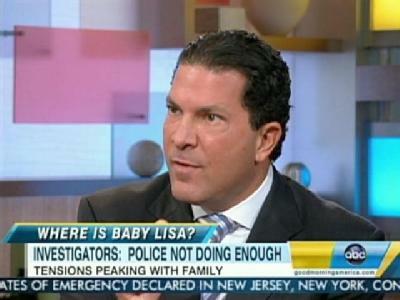 Family lawyer Joe Tacopina, Dan Abrams discuss latest in search for Lisa Irwin. I can not stand this man. "One of the issues I’m having right now with the way this case has been handled is we’re playing a little too much, with all due respect to you all, to the media. This is a search for an 11-month-old missing baby. We have two parents who are absolutely devastated and grieving. To me, notifying the press every time we have a meeting set up is not something I think is advantageous to either side or this investigation," Tacopina said. "I’m not going to give a date of an appointment or whether or not there is an appointment, I will tell you that there will be every necessary interview will be had with law enforcement. I’ve had a very good dialogue with the FBI." Tacopina told legal analyst Dan Abrams that the boys were interviewed for several hours in the first days after the baby was reported missing. "They were in there within days, Dan. But understand there are two things at play here: Of course this family wants answers, and they’ve consented to everything -- every search, every forensic swab, and everything else that needed to be done. But here at play are 6- and 8-year-old children -- two little boys -- and we want to make sure this questioning is done in a way that will not damage them and that there are child psychiatrists and forensic people involved in that," Tacopina said. Someone immediately tweeted a question for Judge Jeanine to ask Bill Stanton. That tweeted question was only there for a few minutes, before being removed from Judge Jeanines twitter page. 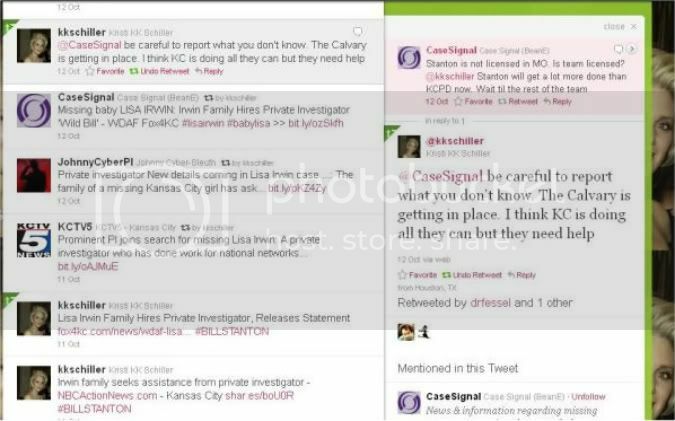 Ask Bill how he knows Mike LeRette from BEFORE the Lisa Irwin case. I got Dr. Fessel's ok to re-post this here. I believe this is the lady behind the reward and hiring Bill Stanton. She is the head of K9s4COPS http://www.k9s4cops.org/OurBoardMembers.aspx and her name is Kristi Hoss Schiller and lives in Texas and she is big, big oil money and Bill Stanton is on their board advisors. She has also been big in the media and somehow got the name Miss Internet. Here is a post on twitter. That is one of the reason I think she is involved. Now just recently Bill Stanton said he actually met a relative of Lisa's through this wealthy benafactor before this case happened. Scroll down to his tweets on 4 oct. He had not made a tweet since Mar 11th then gets on twitter the day Lisa goes missing and makes this post..
No doubt in my mind Mike is the person Bill Stanton met before and I really wonder if Mike is married to one of Schillers daughters maybe. From Brenda K. Netz FB, this picture looks like it was taken from a travel trailer, specifically the window. Was this part of the caravan. If this doesn't work, I hope a mod either fixes it or deletes the post. I can't access Photobucket from here, so I can't bring over the image itself. Im wondering who Mike Thompson (motercycle guy at 4 am) picked from the photos? Thompson picked the man out from a series of six photos Monday. Looks like the inside of our motor-home. News conference live stream. You will see color bars or a black screen until it starts. I guess perhaps you could apply the old saying: "Hell hath no fury like a woman scorned" ????? to this scenario ... ??? Short: "I think it's just sad. That's all I can say, it's just sad. " bit.ly/v9umNq "I move by waht I sense is right." Page created in 8.016 seconds with 19 queries.